There’s nothing more frustrating than trying to get some maintenance done on your car, while layered up with three sweaters, a hat and gloves just to keep yourself from freezing. It’s hard enough to work in the cold like that, let alone concentrate on doing a quality job! These electric garage heaters will help keep your space warm and let you focus on making progress, rather than on how much the cold can go and screw itself. Each of the heaters on our shortlist is extremely durable, simple to operate, and built to last. For each model, we’ve contrasted them against one another to try and highlight what they’d be especially good for (functionality vs. raw power, etc.). In general, however, these heaters are very similar to each other in a lot of respects. With that in mind, we think that looks/gut feeling is as important a factor as any when considering which of these models is right for you. We’ve already done the research and made sure that they’re all quality, durable products. If we were to just recommend one electric garage heater – it would be the King KBP2406-3MP. The dimensions of our compact top choice – the King KBP2406. It just ticks every box that we look for in a good heater. It’s small without sacrificing on heating power, and its all-metal build quality makes it incredibly sturdy. 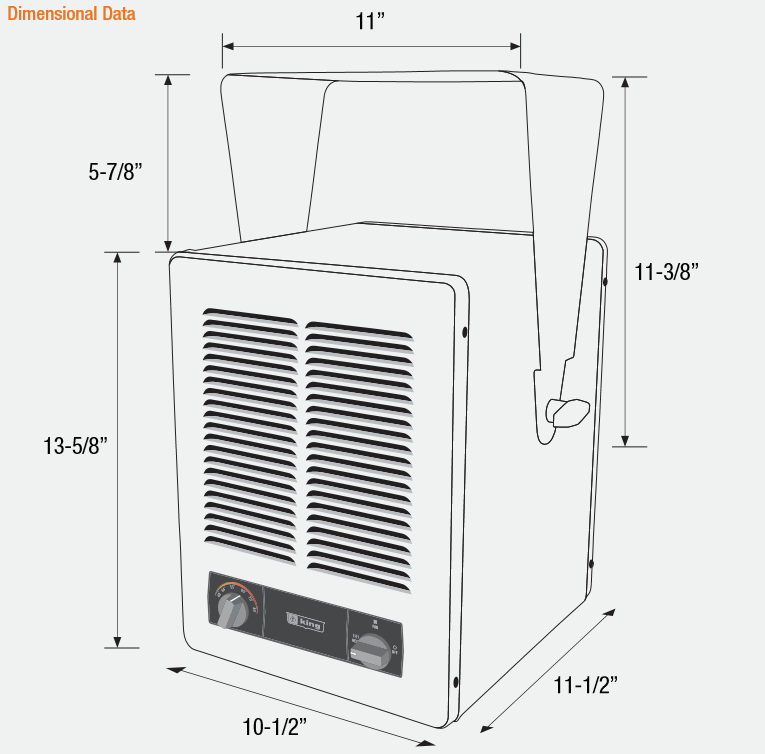 And while we’ve made sure that every heater on this list is durable enough to be placed in any workshop environment (aside from the Vornado heater at the end of the list) – this King model is the only one that’s been produced inside of the USA. The bracket on top makes for easy carrying, or simple wall/ceiling installation, and the variable temperature control on the front makes for easy usability. The price tag is slightly higher than the other heaters at it’s 5700W power range, but we think that it’s extra quality worth paying for. When shopping online, it can be hard to decide which model is actually worth your money. Especially with appliances such as these electric garage heaters. With that in mind, it’s important to know what you’re looking for. We’ve listed the most important aspects of these heaters below. Try to identify which ones are most important to you, and search for a model that has the best performance in those aspects. 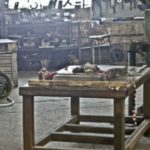 With any appliance, especially one that’s going to be in a workshop-like work environment, sturdiness is a hugely important factor. We’ve made sure that every model in this list is made out of quality metal, and looks to last for years to come. If none of these models catch your eye, just make sure you look for a similar level of stellar build and material quality as you consider other models. The most powerful fan in the world isn’t worth hours of frustration and stress; just trying to get the damn thing to work. Thankfully, these electric heaters are fairly simple to install, and almost all of the models we’ve recommended come with ceiling/wall mounting brackets included. If you’ve never installed a hardwired appliance before, check out this great guide by familyhandyman.com. However, if you’re not too confident, hiring a professional can save you a lot of time and stress. Similar to the above, prioritize heater that gives you full control over your environment. Variable thermostats, remote controls, and multiple power modes score big points here. Features like safety shut-off functions (if the heater is knocked over, or left on) are great for giving you peace of mind, as well as the extra layer of safety. Small in size without sacrificing on heating capacity. These King heaters are small in stature, but superb in heating power. Just 11.5 by 10 inches means they are easy to place almost anywhere in your workshop. And thanks to the sturdy bracket mounted on top, that even includes the ceiling. We say ‘they’ because there are actually three options for you to choose from. With three phase (recommended) and single phase versions, as well as high/low power options (5700W & 240V, or 2850W & 120V). 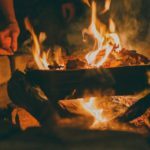 Here‘s an explanation by tripplite.com on why 3 phase is better than 1 phase heaters (and what they mean). The build quality is solid – using entirely metal parts throughout. On the front, a variable temperature dial makes it easy to balance the right amount of heating power for your space. Couple that ease of use with the small size and (relatively) light weight, and this is one of the easiest heaters to use on our list. It doesn’t get top marks in every respect, however. The price is one of the highest one this list (though we don’t mind paying for quality). That isn’t the main issue, though. It’s that King only provide a 1 year warranty with the purchase – which we think should be higher if you’re pricing your product above the competition. If you’ve got a bit of a budget to work with, this heater is a fantastic purchase. It’s got stellar build quality, and it’s small size doesn’t hold it back from packing some real heating power. The sturdy bracket on top makes for easy carrying or ceiling mounting, and the variable control means you can your space to just the right temperature. It’s a bit pricey, and we’re not too happy with King over the short 1 year warranty, but these heaters get top marks in every other aspect. Three great heater models. From standard size (pictured) to super-powered 10,000W models. These Dr. Heater Heater’s (that’s a mouthful..) are another solid option. Made of entirely metal parts, with built-in thermostats and high/low power modes, it’s easy to adjust these heaters to any-sized space. 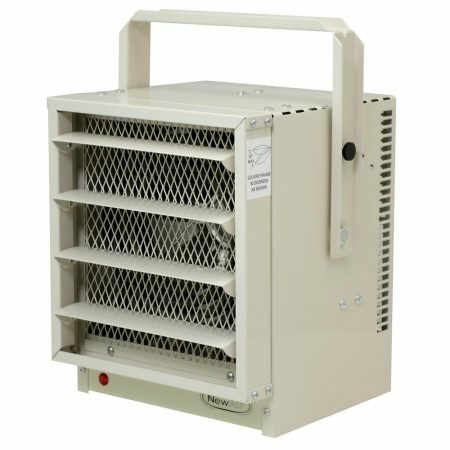 Two heavy duty 240V 10,000W heaters – both wall/ceiling mounted (DR-910F) and cart mounted (DR-910M). The prices vary greatly on the models above, with lower being less than $200, and the heavy-duty models approaching $500 (at the time of writing). Model options aside, each of Dr Heater’s models is highly durable and come with adjustable louvres for directed heating. Unfortunately, they only come with 1-year warranties, but they don’t look like they’ll be breaking down any time this decade. With solid build quality, built-in thermostats, and mounting brackets included – each of these Dr. Heater models is a great all-rounder that can take on any size of garage space; depending on the model. The heavy duty 910 models are also some of the most powerful garage heaters on the market. If you need some serious heating power, you don’t get much stronger than 10,000W. Another reliable electric garage heater with great build quality. 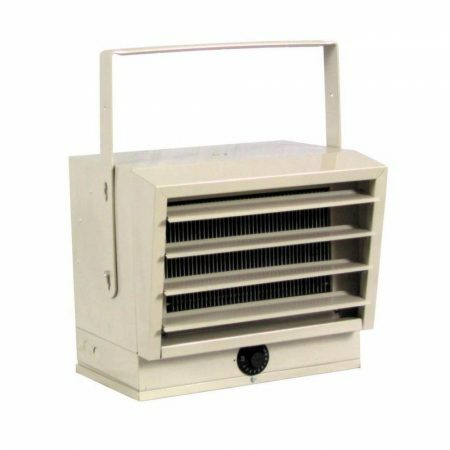 This 5000W NewAir garage heater is purpose-built to be used in shops/garages – coming with a wall/ceiling mounting bracket included. With a lightweight of around 15 lbs and adjustable louvers for controlling the heat direction, it’s easy to incorporate this model into almost any garage space. For a product that’s made in China – the build quality is solid. Full metal construction looks like a modern version of those 1950’s products that seem to last forever. While heaters are never cheap to run, an auto shut-off feature means that you won’t be paying dearly for forgetting to switch the heater off. It’s also hardwired, meaning you’ll never need to perform (or pay someone to perform) maintenance on the electrics. A great all-rounder heater. Competitively priced from a company that’s proven to take care of their customers – there are multiple stories of new models being shipped immediately to solve any delivery issues – these heaters are a great option. With a medium-power level of 5000W, they work for spaces up to 500 square feet. The included ceiling/wall brackets also mean they’re easy to place wherever you need. 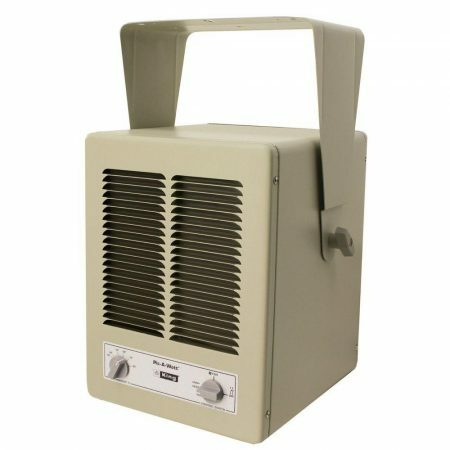 This Fahrenheat heater produces high fahrenheit temperatures..
Fahrenheat’s FUH54 Garage Heater is another rugged and durable electric model. Fully metal parts and an included ceiling bracket makes for a long-lasting use on an easy-to-install product. Automatic functions halt the fan from operating until the unit is heated and ready, as well as stopping operation if things start to get too hot. The adjustable thermostat is simple but effective, and while the 1-year warranty leaves a bit more to be desired, it’s the standard warranty length for these products. Operating at low (2500W) or high (5000W) power, the Fahrenheat’s got enough heating action to keep anything up to the largest garages or workshops warm. 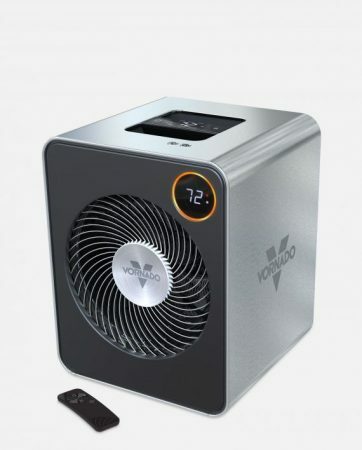 If you need some extra oomph, there’s also the FUH724 model (link goes to Amazon) – which packs another 50% (for a total of 7500W) of heating power. Another solid electric garage heater. With all of the standard boxes ticked (durable, powerful, easy to install and use) without having any negatives that aren’t also exhibited by the other models in this list. It’s another top quality option – and while it doesn’t have features to make it particularly stand out, it’s arguably just as good as any of the other models here. Not as rugged as the other models on this list, but great functionality and warranty length. This heater isn’t quite dedicated for use in a garage or workshop, but it’s still a worthy inclusion to our top five list. An unbeatable level of functionality and ease of use. A long-lasting warranty: 5 years long. Auto-climate control, two bright LED displays, an included remote control – and Vornado’s own vertex heating technology. It’s not the sturdiest product (though it is fully encased in steel), but it’s got a fantastic modern quality that standard industrial heaters can’t match. With its small size and sleek looks, this Vornado heater will snugly fit in any modern garage. 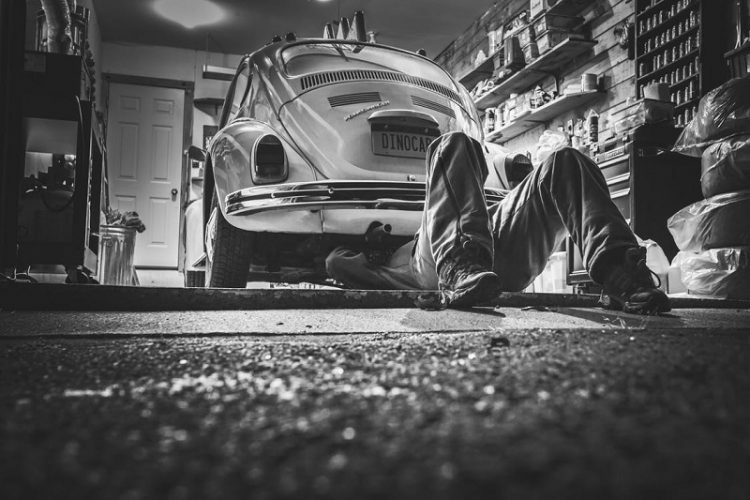 Don’t get us wrong – keep it well away from hazardous work environments – but for simple garage use like working on a vehicle or a small project, it can be perfect. While this heater doesn’t bring the power that the others on this list can, you really can’t beat the functionality that it brings. It’s all of the benefits of a modern home heater (climate control, remote, LED displays), contained inside a durable steel case. Plus, the 5-year warranty completely outclasses the competition. 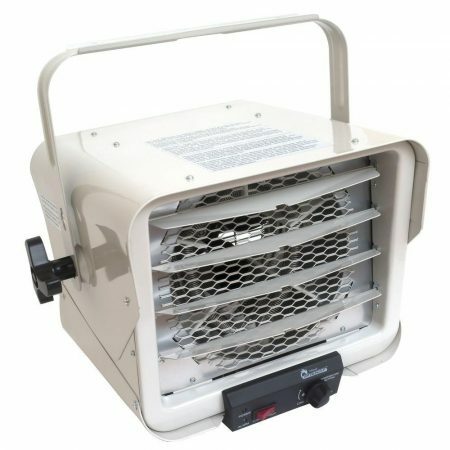 Perfect for a small sized garage or workshop: as long as your shop projects are going to be fairly standard/light work, this heater could be a great solution. Garage heaters are crucial if you want to continue working on side projects and vehicle maintenance during the colder months. Ensuring you’ve got a great model will go a long way to making sure your money’s been well spent. Each of the heaters in our list has been chosen because of their quality. There are no weak links here – from the lower powered King to the heavy duty behemoths produced by Dr. Heater. Every model is fully constructed out of metal, easy to install – either at ground level or above – and produces easy to control heat. Unfortunately, the industry standard for warranties is just a year – but we’ve included the Vornado heater at the bottom of the list to try and make up for that. Vornado is known for their huge warranties, and the 5 years warranty on their heater is a testament to their fantastic customer support. We hope that you’ve found a heater that will work for you. If not, just keep our buyer’s tips in mind as you continue your search. 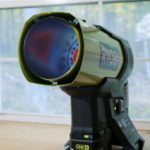 However, many of these heaters are similar in terms of their functionality – so we really do think that there’s a heater on this list for everyone.